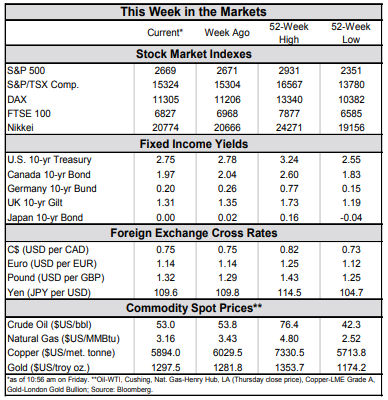 Global equity markets are up on the week, despite some negative economic news, and continued dysfunction in Washington. The ECB characterized the economic risks as to the downside, and will be more cautious removing stimulus. Amidst the U.S. partial government shutdown there was little data to unpack. Home sales showed a sour end to 2018 for real estate. Negotiations in Congress continue, but there is no clear end to the impasse at time of writing. 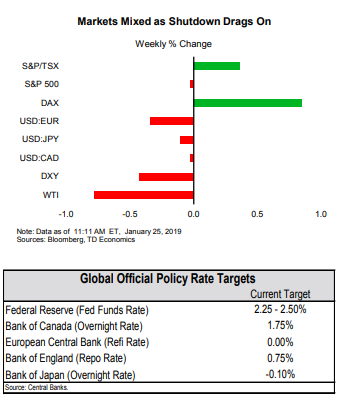 Next week we get some key events – an FOMC rate decision with a press conference, and a payrolls report. Furloughed federal workers are expected to lift the unemployment rate, but should not affect the payrolls tally. Global equity markets are up on the week, despite some negative economic news, and continued dysfunction in Washington. 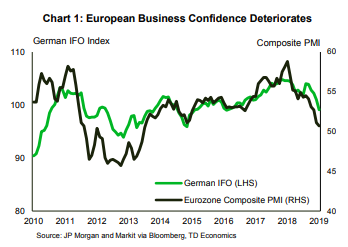 Most notably, Mario Draghi said that the risks to growth have moved to the downside, and the ECB will be even more cautious withdrawing stimulus. 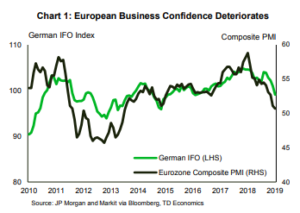 This more cautious view was supported by recent data, which showed worsening sentiment in the manufacturing sector, and in its leading economy (Chart 1). We also got confirmation that China’s economy slowed dramatically in the second half of 2018 (Chart2). The rebalancing of China’s economy towards domestic consumption is underway, but the downward pressure from weaker construction and infrastructure investment on headline growth is being exacerbated by unanticipated declines in consumer and business sentiment resulting from trade tensions with the U.S.. 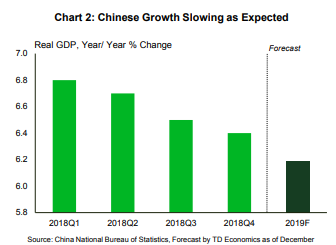 So far the data remains consistent with our December forecast that calls for Chinese economic growth to slow further to 6.2% in 2019. With the U.S. partial government shutdown affecting some government statistical agencies, there was little economic data this week. We did see that the resale housing market ended 2018 on a weak note, but we don’t know what the housing starts or permit picture looked like. Looking ahead to next week, the closely watched advance release of Q4 real GDP growth is likely to be delayed. The incomplete picture of the U.S. economy is coming at an inconvenient time. Economists are trying to determine if the weakness in financial markets in the fourth quarter, which has already contributed to dampened consumer and business sentiment in survey data, is also showing up in real measures of spending and activity. The Federal Reserve will still meet next week amidst the shutdown. We will get to hear from Chair Powell at a post-meeting press conference, as the Fed moves to holding a press conference at every meeting. The Fed is widely expected to keep rates steady, consistent with recent speeches, which emphasized the ability to be patient to see how the economy fares in the wake of slower global growth and the deterioration in sentiment. Fortunately, we are not in a total data vacuum. Next week, the BLS will release employment data, where we will see if the blistering hiring activity in December carried over into January. As legislation has been passed guaranteeing furloughed federal workers back pay to cover the shutdown, these workers will not dampen the payrolls tally. However, they are still likely to boost the unemployment rate. The reference week for the Household survey was January 6-12th, and furloughed federal employees (0.2% of the labor force) would be classified as unemployed. Assuming federal workers are appropriately sampled in the survey, this could result in a 0.2 percentage point boost to the January unemployment rate. Meanwhile, the economic hit from the shutdown continues to mount. Growth in the first quarter is looking soft at 1.4% (annualized), assuming a 0.2%-pt direct hit from the shutdown if it lasts to the end of January.